The Nobel laureate said: "Although Nepali democracy confronts many challenges and problems from time to time I found it inspiring that the spirit of democracy never wanes in this country." "Democracy is not just the rights and freedom of the people, it is also the responsibility that you should have to the society and the country," she said during an event to mark the birth centenary of Nepal's first elected prime minister BP Koirala. 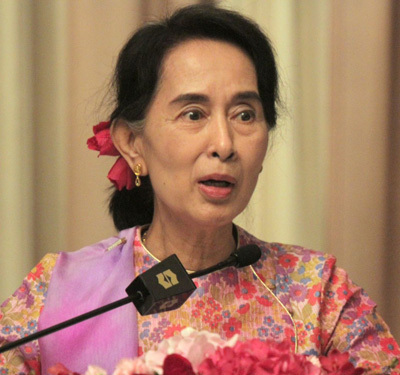 In Myanmar the military rulers not only imposed dictatorship but "they are also trying to control everything in a way that Burmese people are not capable of shaping their destiny," she said during the event. "Development is the enhancement of human spirit. If we are to make progress in a healthy way the spirit of our people must be enhanced. We have to overcome poverty because poverty hampers the development of human spirit," she said. Expressing solidarity to the democratic struggle being launched by the people of Myanmar, Prime Minister Sushil Koirala said, "Nepal wants to see Myanmar move forward in the path of democracy and development." He said it was only in democracy that government honours peoples' consent, and added that "democracy is indispensable for the development of the country." Koirala said the two countries can work together in the fields of developing hydro-power to boost development, and also help each other in the tourism sector. Earlier today, Suu Kyi called on Nepal President Ram Baran Yadav at Rashtrapati Bhawan in Kathmandu. "We share your undying faith in democracy and humanity and your solid conviction that democratic values and fundamental rights are not only essential but possible in our society," said the PM during the meeting.